Bedrock Games have a “Pay What you Want” RPG in the form of Wandering Heroes of Ogre Gate. The wuxi inspired game has its own detailed martial arts setting and uses the Network System. There’s 180 Kung Fu techniques in the game, along with tips on how to help the game develop and art from Jackie Musto, Michael Prescott and Joseph Vandel. Geek Native has been able to quiz Jackie about Wandering Heroes of Ogre Gate, her other projects like Kay and P and about how she got involved in illustrating for RPGs in the first place. Before we dive into the Q&A with Jackie Musto let’s take a look at the trailer for Wandering Heroes of Ogre Gate, the legacy of the Demon Emperor, so you can see it for yourself. The game is written by Brendan Davis, Bill Butler and Dan Orcutt. How did you get into illustrating for roleplaying games? I really began illustrating roleplaying games for my friends! It sounds quite funny, but in middle school I fell in with a rowdy crowd of table top gamers and fell in love. Joining in the game I’d listen to them describe and play their characters, then I jut naturally started drawing them and our adventures. I always wanted to illustrate for roleplaying books someday, actually. When I looked at the quality of the illustrations in the books we played with, I was enamored by the art and how magical it all was. It set me on a path. I would come up with amazing stories and ideas, and they ended up becoming comics and all the other art I make. I am absolutely a dedicated gamer! I still have a bi-monthly game I play with friends (some from my original middle school days), plus video games, boardgames and the occasional card game. Currently I’m playing a very cool hyena character in my tabletop RPG and wind down with a little Katamari in the evenings. What was illustrating Wandering Heroes of Ogre Gate like? Have you drawn for a similar genre before? My comics and most of my interests have a pretty big fantasy slant, so sword fights, honor duels and that sort of thing are up my alley. It’s the first time it’s been such a prominent part of my freelance work however, and I am profoundly lucky to be able to draw upon personal interests to work on this project. What’s it like illustrating for an RPG compared to a comic strip? Are their lots of revisions? Do you get a walk through and an explanation of details from the book’s authors? I think the main difference between illustrating for comics versus an RPG is that you’ve really only got one “panel” to tell the whole story, as opposed to several pages worth. I have to try and get all the right details in the image to make sure the idea conveys correctly. Nuance is hard to do with one image, so I spend a lot of time trying to find the perfect angle or point of view to capture everything. Luckily, I think Brendan and I are really on the same page for what we’re looking for. He gives me tons of descriptions, passages from the books and inspirations for each image. He has a really vivid idea of what he sees in his head and I think I’ve been able to capture it pretty well so far! It’s also great to work with someone who’s open to ideas and changes, and respects the artist’s opinions. What makes a good brief for an RPG illustrator? What do you need to know? I think the things you need to know to be a great RPG illustrator are the same things you need to know to be a great artist in general. Fundamentals like composition, contrast, color – thrown in with a dash of storytelling. Having the ability to read a description and watch it play like a movie in your mind is how I find my frame. I almost feel like a director sometimes, moving the camera around to get my actors in just the right positions. I believe anyone who has played a roleplaying game and watched the story unfold in their head can know what I’m talking about! What’s coming up for Kay and P? Any teasers to share with fans? Well I hate to give spoilers, but in the current issue of Kay and P we’re watching Kay tackle a sticky situation with a very friendly but demanding monster – and while she might call upon a couple of friends for help, it might backfire in her face just a little bit. She’s a resourceful person though, I’m sure she’ll figure something out! What was the inspiration behind The Adventures of the Lady Skylark? It was, probably unsurprisingly enough, a roleplaying game! Lady Skylark was my character, and after the game got scuttled she was just sitting around in my brain making a huge fuss. She absolutely though she didn’t get enough “screen time” and demanded an encore performance. Chris, Lady Skylark’s writer was also involved in the game so we decided to detach the characters from the game and develop a whole universe to have them run around in. You’re so busy – why run three web comics on top of all your freelance illustrating? Well, it’s only two comics (right now, ha ha), but I get your point! I just can’t stop working. I’ll draw all day and wind up doodling on my couch at night too. I really need to learn to give myself more breaks but I just desperately want to tell stories. I don’t always have time for everything I want to do, but I have sketchbooks just teeming with ideas for when I have a spare moment. Oh, and I teach too. Somehow I find time for that – I don’t think I sleep! Lastly, what three tips would you give to illustrators hoping to enter the RPG hobby space? One: build yourself a toolbox to draw upon. By this, I mean studying art fundamentals. A lot of people think, “If I want to draw cartoons/manga/comics/what-have-you then all I need to draw is that!” It couldn’t be further from the truth! Really excellent artists have drawn still lives, figure drawing, painted and sculpted – basically tried as much as they could. You never know when you’re going to have to draw a horse, or a car – or a body twisted into a position you’d never find exact reference for! Having a grasp on basic details of anatomy will help for those situations. Knowing your composition and framing will make dynamic images exciting, and tone and color can make things clear and engrossing. Just keep practicing, drawing and studying. When you’ve got a decent portfolio of images that show those things, clients you apply to will be excited by what they see. Two: tell your own stories. They don’t have to be long, but if you can show dynamic character design and the ability to make a universe for them that’s equally as interesting than you’ve won half the battle. Three: play games! This has two purposes – you won’t burn yourself out with over work, and you’ll build a stable of publishers to pitch yourself to. Having a working knowledge of the scene will give you an idea of current trends and what’s expected of the art in the field as well. 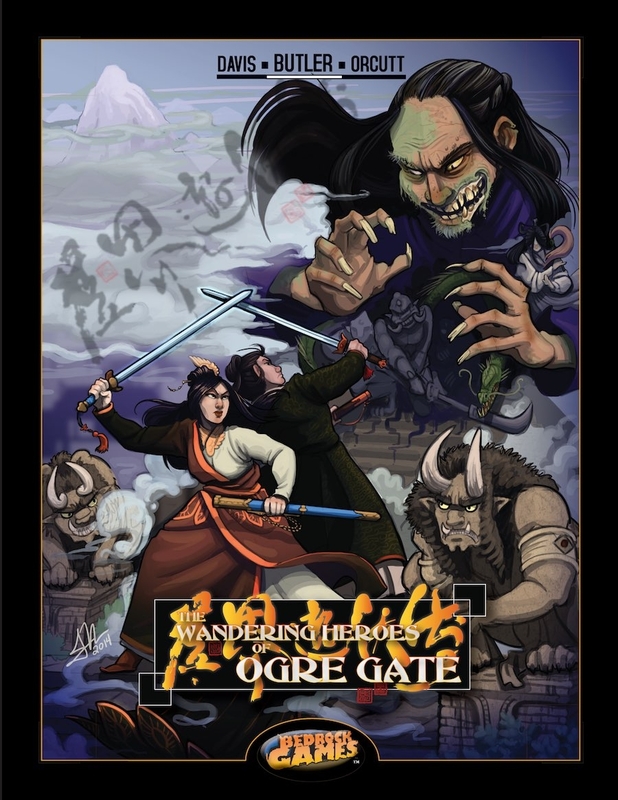 You can sample Jackie’s art in Wandering Heroes of Ogre Gate and visit the wuxia-infused world of sects, sabers and kung-fu masters for free or as much as you want over at DriveThruRPG.